Jurgen Klopp spoke injuries, his FA charge and Burnley‘s difficult start to the season ahead of Liverpool’s trip to Turf Moor on Wednesday night. The Reds head to Lancashire this week as the Premier League‘s second- and 19th-placed sides face off in a clash of vastly differing fortunes. Klopp’s side have started the season in excellent form, with Sunday’s 1-0 win over Everton extending their unbeaten league record, with 11 wins and three draws in 14. Meanwhile, Burnley have won just twice in the league so far, losing nine and drawing three, with possible overachievement last term taking its toll. 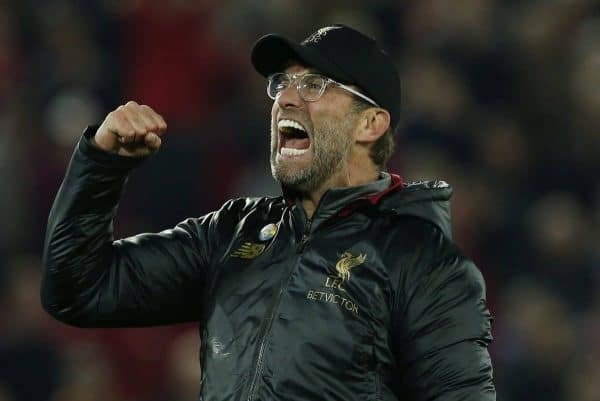 But speaking at Melwood on Tuesday afternoon, Klopp insisted this would be a tough game for the visitors, particularly given the proximity to the Merseyside derby. “We are now all long enough together to know about the specific challenge in a game against Burnley,” he said. “It’s a really tough place to go, since I’m in it was always tough. “We don’t think or speak too much about the game before, sometimes things are obviously similar or different, but it’s really not like this. The manager was fined £8,000 and warned over his future behaviour. And with Liverpool facing absences just three days after the game, he provided an updated on the fitness of Sadio Mane and Andy Robertson. “Sadio has a really awful cut on his foot, it needed to be stitched,” he explained. “It’s OK, but he’s walking in flip-flops and we don’t play in flip flops! Today he’s not ready, but we will see later. The Reds are on the road in both of their games this week, with a long journey to Bournemouth to come for Saturday’s 12.30pm kickoff, before returning to take on Napoli at Anfield on Tuesday. This ensures little time to recover, and therefore the best means of keeping rhythm is for a strong performance at Turf Moor, and another three points.